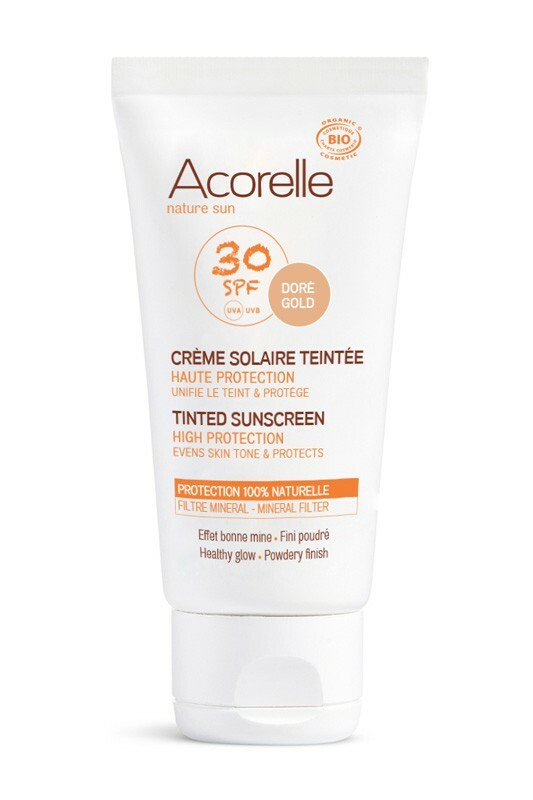 Acorelle Organic Tinted Bronze Sunscreen Cream for Face provides SPF 30 protection for face against UVA and UVB rays. Bronze tint, its natural formula combines a mineral sunscreen as protecting shield with organic argan oil to nourish skin. 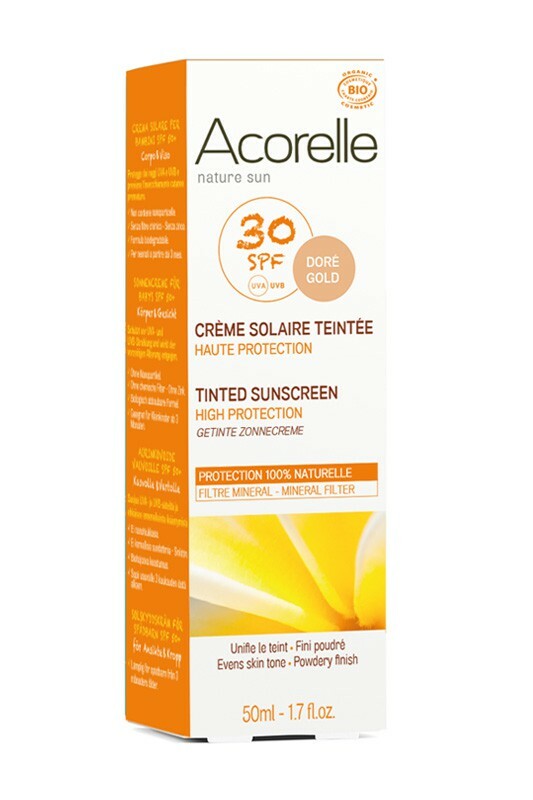 Non-sticky and water-resistant, Acorelle Natural Tinted Bronze Sunscreen Cream's unify and brightens your complexion ! This Organic Tinted Bronze Sunscreen protects safely your skin ! 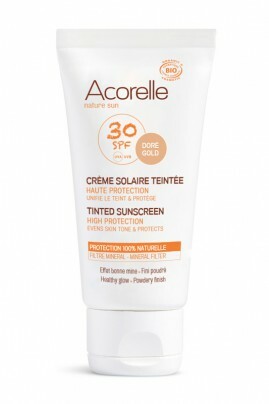 Shake well before use and apply Acorelle Tinted Bronze Sunscreen Cream on your face before exposure to the sun, in sufficient quantity (2 teaspoons for an adult). Reapply frequently to maintain protection, especially after sweating, swimming or toweling. Do not spray directly on the face. Avoid contact with eyes. Choose the appropriate SPF to your skin type. Do not stay too long under the sun even if you use a sunscreen and avoid exposure between midday and 4 PM. Sun overexposure is a serious health threat. Not suitable for children under 3 years old. Do not expose babies and young children to direct sunlight. Wearing a hat, covering clothing and sunglasses is highly recommended. Natural composition & protects efficiently your skin against UVA and UVB rays ! COCO-CAPRYLATE, DICAPRYLYL CARBONATE, ZEA MAYS(CORN) STARCH*, CERA ALBA*, TITANIUM DIOXIDE, ALOE BARBADENSIS LEAF WATER*, POLYGLYCERYL-6 STEARATE, SORBITAN ISOSTEARATE, POLYGLYCERYL-3 POLYRICINOLEATE, MANGIFERA INDICA FRUIT*, ALUMINUM HYDROXIDE, STEARIC ACID, POLYGLYCERYL-3 DIISOSTEARATE, SORBITAN CAPRYLATE, PARFUM (FRAGRANCE), BISABOLOL, HELIANTHUS ANNUS HYBRID OIL*, PROPOLIS EXTRACT*, PONGAMIA GLABRA SEED OIL*, HELIANTHUS ANNUUS (SUNFLOWER) SEED OIL, TOCOPHEROL, AQUA (WATER), POLLEN EXTRACT*, LYSINE, OLEA EUROPAEA FRUIT OIL*, POLYGLYCERYL-6 BEHENATE, ARGANIA SPINOSA KERNEL OIL*, MICA, POTASSIUM SORBATE, SODIUM LAUROYL GLUTAMATE, SODIUM BENZOATE, CITRIC ACID, MAGNESIUM CHLORIDE, BENZYL BENZOATE, BENZYL SALICYLATE, EUGENOL, GERANIOL, LINALOOL, CI 77891, CI 77492, CI 77491, CI 77499.